"Accept An Amputation That You Cannot Change!" This article is focused on accepting an amputation. I’m Dave Klar, and I’m a 29 year old above knee amputee from a motorcycle accident. This August it will be four years since I got hit off the motorcycle. On August 17, 2014 I was riding with a friend, we were both riding our own bikes. A drunk driver came left of center and hit me off my motorcycle. I remember a lot from the wreck, most importantly was the off duty state trooper that stopped the bleeding and saved my life. I thought I would wake up with the broken leg fixed. But later that night I woke up with an above knee amputation. Hooked up to tubes, an IV, and who knows what else. I was traumatized by all this. Wait I can’t believe this! Is this a bad dream? No, this is reality! A few days after being in the ICU I was moved to acute therapy. One of the pivotal moments during my hospital stay was when my physical therapist told me to sit up in my bed I told him I can’t. Scott replied: „Well you are going to do this! Im not leaving, Dave.” People that have gone through a life altering injury know what I’m talking about. My support team started during my stay at the hospital. Many school friends and family sent me their get well wishes and came to visit. After perseverance and unwillingness to quit came small goals. I interviewed three different prosthetists. One guy that really stood out to me was Ronnie. He is an amputee. Being able to relate to him I decided to choose him to build my leg. It seemed he really cares about his clients. After thirteen days of having the leg I walked my first mile unassisted with my brother on my side. Still after accomplishing walking I dealt with physical and mental pain. The amputated leg pain got desensitized after wearing the prosthesis for three to six months. The mental pain was more difficult in some aspects. Seeing yourself with out a limb you had for 25 years is hard, having phantom sensations is intense and adjusting to the sensitive new affected leg can be sad. But meeting and talking with other amputees has helped me a lot. A busy life and recreational activities keep me motivated. Working in the tree care industry there isn’t time to think about what has happened to you. When you are roping tree limbs over houses, missing wires and keeping the climber safe. I mean your mind is on the job at hand! This brings up a key aspect in recovery; that aspect is distraction. Keeping the mind away from a traumatic experience. My recreational activity is rock climbing. Climbing is great for me because I forget about the amputation and what caused it. In my opinion if someone has gone through a traumatic event in their life they need a healthy outlet. A dream of mine was to climb Devil’s Tower, America’s first national monument. In north east Wyoming where it's kinda flat, the prairie dogs run, and there is a radical rock formation thats 900 feet tall in the middle of nowhere. That tower just has to be climbed! Taking a step back to 2010 is when I first saw that tower after riding the motorcycle 1700 miles from my home. After losing my leg and rock climbing I knew I had to conquer the tower. In 2017 I got to climb with some amazing climbers and on my birthday to boot ha! We climbed on the tower and I got two different summits of the tower. We climbed a lot in my month long stay at the tower and the guides pushed on some hard rewarding climbs. It was so cool to climb with the people I look up to. The summits were emotional, fun, but a turning point in my amputation recovery. In April of 2018 I did my first multi-pitch trad lead climb at Seneca Rocks in West Virginia. After all the highs and lows in the past four years I’ve learned to accept this amputation that I can’t change. I accept limitations but knock down perceived boundaries of people with a “disability“. Guest post by Dave Klar. 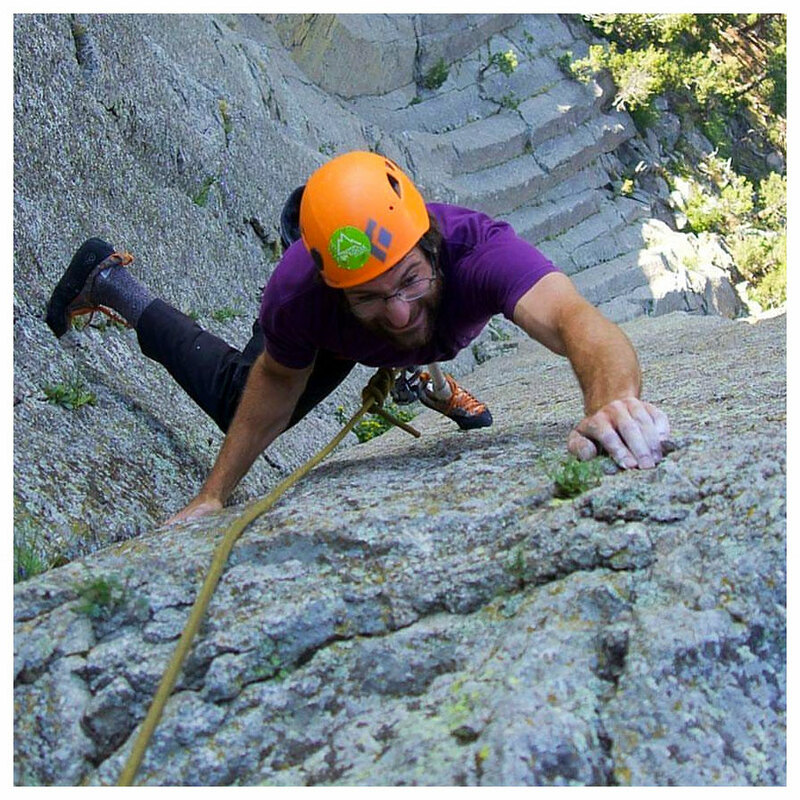 Dave is an above amputee, a tree service worker and rock climber. He lives for the great outdoors. You can check out his adventures on Facebook and Instagram.